The Big Inning - Cursed To First - Sox and Pats forever. The breaking ball: Much better last time. Saturday, Beckett threw only four of 17 curveballs for strikes. Something to refine in his next side session with pitching coach Curt Young. The big innings: A nuisance so far. The Pirates scored four runs off him in the fifth inning last Sunday, then scored five off him in the fourth on Saturday, an inning that began with a fielding error by Nate Spears and included a throwing error by catcher Jarrod Saltalamacchia Only one of the runs Saturday was earned. Getting out of trouble was hardly a strong suit last season for Beckett. With runners in scoring position, hitters posted a .338/.432/.507/.939 line. For the second straight start, Josh Beckett fell victim to a big inning against the Pirates in Bradenton. Saturday Beckett's outing was clouded by a five-run fourth inning in what would ultimately turn into Pittsburgh's 7-5 win over the Red Sox. 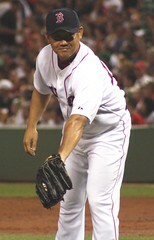 In the pitcher's previous outing, he allowed a six-run fifth inning to the Bucs. "I’ve got to stay away from the big inning," Beckett said. "My last two starts, those are the glaring things." Beckett finished his afternoon going 4 2/3 innings, giving up five runs (one earned), and seven hits, striking out two and walking one. Besides the big inning, the starter's most pressing concern was an inability to control his curveball. "It was [terrible] today," he said. "I think I threw four of 17 for strikes. Definitely got to do better than that and I did better than that in my last start. You’re trying to throw 0-0 curveballs for strikes, not balls. I threw a couple that I was trying to throw for balls, but that number’s still got to be better." "It was pretty similar, it was just a different inning," Beckett said after Boston's 7-5 loss at McKechnie Field. "Big inning there in the fourth inning instead of the fifth. I felt good in several of the other innings." Beckett threw 83 pitches, 49 for strikes, and he threw 34 pitches in the fourth alone. He said the advantage to pitching out of jams in spring can be a confidence boost, but he wasn't trying to spin the frame all that positively. "That's a lot of pitches in one inning," Beckett said. "I think if that inning would've probably dragged on a little bit longer, I probably would've ended up having to finish up in the bullpen. I don't think anybody likes to have the pitches extended that much in one inning." Only one of the runs Beckett allowed was earned, but he still took responsibility for being unable to stem the damage. Meanwhile, just what the hell got into Daisuke Matsuzaka on Sunday? Maybe it was a new warmup routine. Maybe, as @RedSoxRedShoes put it, it was due to "strikezone the size of my inflamed liver." But there's no word for what he did on Sunday but "dealing," and pitching with tempo, efficient mechanics, even challenging hitters with fastballs and mixing his pitches. On the podcast I did with the SG guys a couple weeks ago, we joked about Beckett throwing Dice into a bag and onto a barge bound for some far-off, exotic destination. But at least this weekend, it looked like maybe Dice had beaten him to the punch and sapped his mojo somehow. How else can you explain their respective performances this weekend? Because, come on. Do I really believe Daisuke's going to become the staff ace this year while Beckett takes his place at the bottom of the rotation, and the top of our shitlists? (Okay, he's already projected fourth, which is the bottom, but I mean the very bottom.) Color me skeptical, especially since we've seen flashes of brilliance like this from Daisuke before, but he has so far always regressed to the mean. Still, you never know. And even if you ever did, you certainly wouldn't know when it comes to baseball on March 22.Thus the Fog of Spring Training continues...though some of the bigger question marks are finally starting to coalesce in the mist. Josh and BIG innings---haven't we seen this movie before?? ?